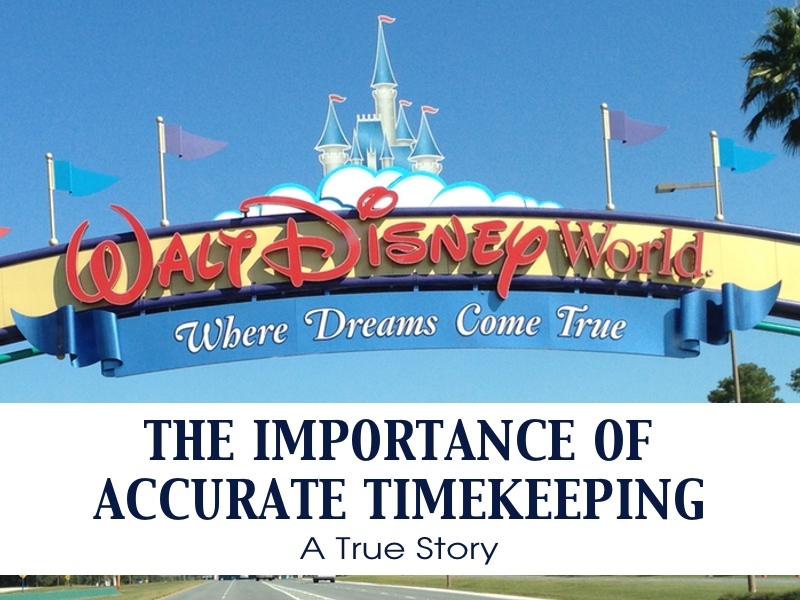 $3.8 Million Disney Fine Underscores Importance of Accurate Timekeeping | Portland Payroll, Inc. When organizations run afoul of labor laws, the fines can be staggering. Recently, Walt Disney Co. reached an agreement with the Department of Labor to pay out $3.8 million to 16,339 employees. The DOL’s Wage and Hour Division determined that Florida-based Disney Vacation Club Management Corp. and Walt Disney Parks and Resorts U.S. Inc. failed to adhere to the Fair Labor Standards Act overtime, minimum wage, and record keeping provisions. Do you employ hourly staff members? Are you in compliance with all DOL regulations? DOL officials say that the illegal Disney practices are fairly widespread. Keep in mind that the pre- or post-shift duties for the Disney staff members could have only taken a couple minutes. If a team member is supposed to change into a uniform (or costume in the Disney case) before their scheduled shift, they must be paid for this time. Do you require your employees to get their workstations ready, or perform other tasks before their designated shift start times? If you are using paper timesheets, it’s almost impossible to accurately track staff member hours. TimeWorksPlus, TimeSimplicity, and TimeWorksTouch make up the Swipeclock Workforce Management Hub. Swipeclock Workforce Management Hub solves your compliance headaches. Because our suite is fully integrated, you won’t have any troubles getting all of your time and attendance, scheduling, and payroll data synced together correctly. Call today for a demo and learn how Swipeclock Workforce Management Hub can help you avoid the expenses of a labor audit. Portland Payroll offers Swipeclock Workforce Management Hub, the powerful, fully-integrated Workforce Management Suite that makes it easy to optimize the performance of your managers, employees, and organization. Swipeclock Workforce Management Hub includes TimeWorksPlus, TimeSimplicity, and TimeWorks Mobile. Swipeclock Workforce Management Hub is developed for busy employers like you who need to streamline scheduling, automate time and attendance tracking, maintain regulatory compliance, and reduce labor costs. How much can you save? Check our Portland Payroll ROI Calculator. We can get you up and running with Swipeclock Workforce Management Hub in minutes. Contact us today to schedule a demo.